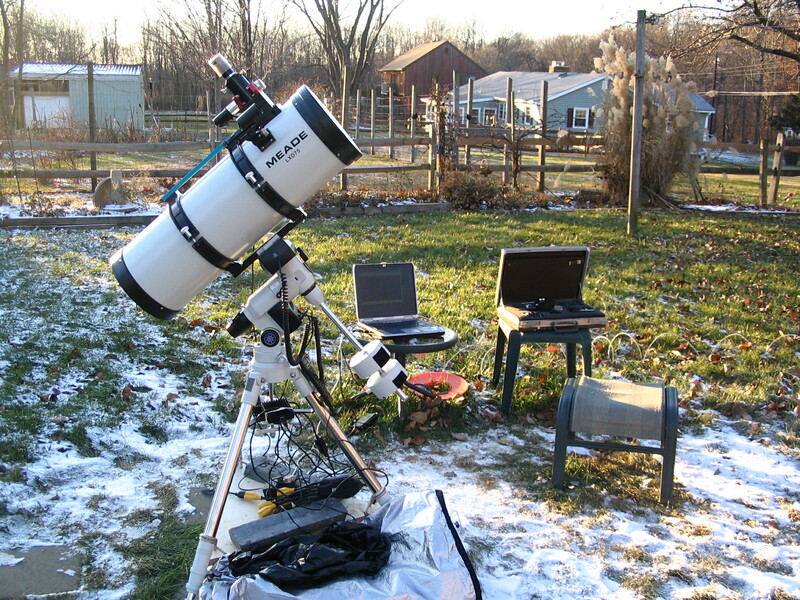 As You may have read on the home page I started this hobby with a Meade DS114 AHA Newtonian Telescope Computer controlled with a 494 hand box in December of 2006. After perusing the web and various Yahoo groups I decided to purchase a Phillips SPC900NC web cam to use for imaging. I applied the Long exposure (SC1) mod to the camera, removed it from it's housing and placed it and the new circuitry into a plastic project box. I added a small fan for cooling in the summer. That was my starter outfit. Since I was new to astrophotography I started out with easy things to practice with, the sun and the moon were some of my first targets. You can see some of the images in my Gallery page. To image the sun I needed a solar filter to limit the amount of light that enters the telescope. I found the right material on the web and made one to fit the telescope. This combination worked OK. 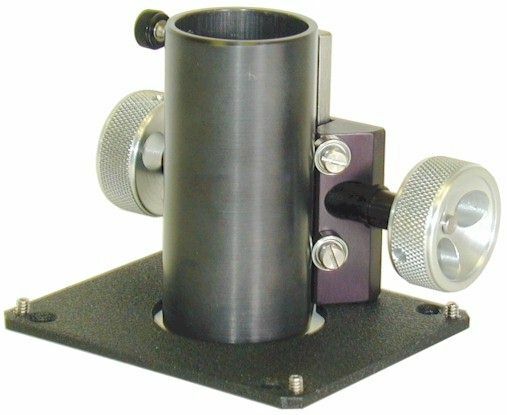 The only issue I had was with the Meade focuser that came stock on the telescope. It is real sloppy. Ok for viewing but almost useless when you are trying to adjust the focus while using a camera. Just touching the scope would cause the image to wiggle so bad that it was almost impossible to get a fine focus. My solution to this problem was a JMI motorized reverse Crayford focuser. 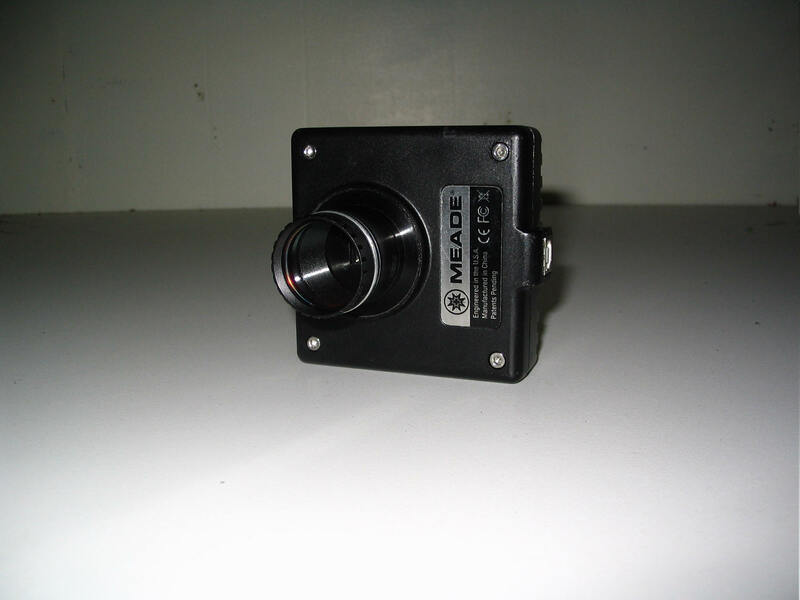 This unit is extremely smooth in operation and because it has a motor drive there is no need to touch the scope in order to focus. When using the telescope and camera combination at prime focus the field of view (FOV) is very narrow. In order to take some wide angle shots I purchased an adapter from web caddy to allow me to use my Canon SLR camera lens with the web cam. .
My setup with the 114mm scope looks something like this. I use a laptop running Windows XP to control the scope and the camera and capture the images. When I'm done I transfer the images to my desktop and process them with a variety of programs. This setup served me well through most of the year but I was looking for something that would be a bit more stable and have better tracking. Again off to the web I went to see what was available for a reasonable price. 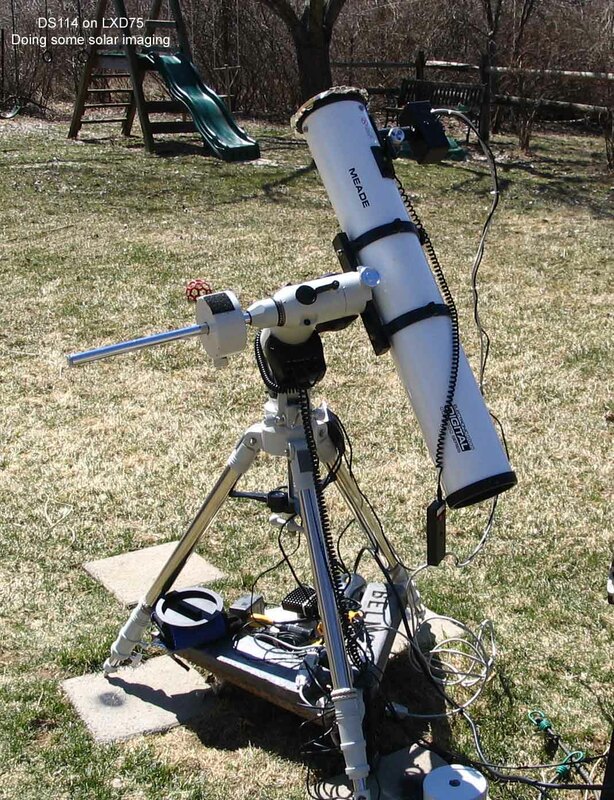 After consulting with my friends in the QCUIAG group and other sources I figured that an equatorial mount is the thing to get with something around an 8" telescope. The budget was around $1000. 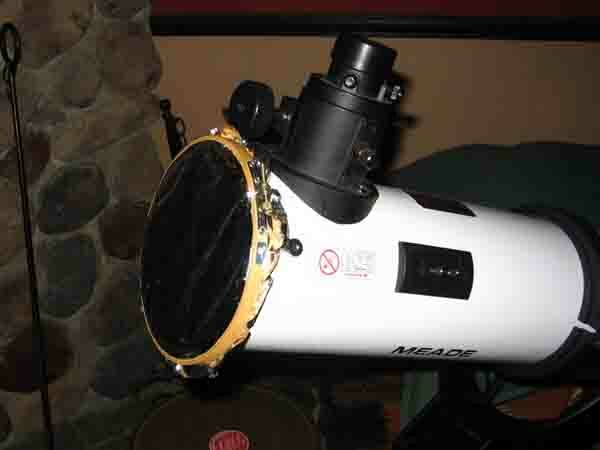 As luck would have it, someone was selling a Meade LXD75 equatorial mount with a SN8 telescope which was fitted with a motorized Moonlight focuser. I checked into it and found the deal too good to pass up and purchased the setup. As you can see in the picture at right the telescope is a 8" Schmidt-Newtonian with a focal ratio of f4 which is very fast optically. The scope is controlled by a 497 hand box. However, most of the controlling and imaging is done thru the laptop computer. 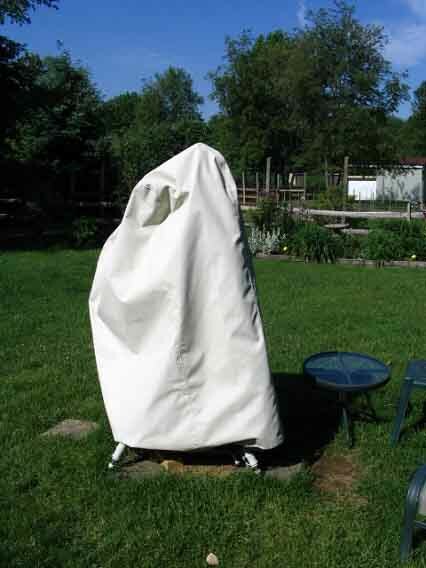 To reduce the need to sit out with the scope during imaging sessions on the cold winter nights. I connected the laptop to my local area network at home via a Cat5e cable (don't have enough ports on the laptop for wireless, besides the 100' of cat5 was cheaper than a wireless card for the PC). I loaded VNC on both the laptop and the desktop in the house and control the laptop that way. Work like a dream. Now I can stay relatively warm while pursuing my hobby in the winter time. Well I've been using the LXD75/SN8 combination for about 4 months and it does a decent job at allowing me to image some deep space objects. ( see some on my gallery page). A new wrinkle that came about using then equatorial mount for imaging is that you must have good polar alignment. Setting up the Az/El mount on the DS114 is straight forward. Point the scope to the magnetic North and make sure that its level. That's pretty much it. Polar alignment is another animal all together. The LXD75 comes with a polar scope which you use align the mount to point the north pole. If you don't have a Polar scope you can use the drift method. The drift method, though very accurate, is tedious and time consuming when done right( can take 30 minutes or more). In learning about polar alignment I came across a method the uses two stars, POLARIS and KOCHAB, along which you align the counter weight bar and then shift the mount until Polaris is in the circle of the polar alignment scope. This is called the Kochab Clock method . Using this process I've been able to image within the PEC (Periodic Error Correction) limitations of the mount. The main issue that I have is that there is enough error in the RA worm gear which causes the image to swing east and west slightly that exposures longer than 15 seconds become problematic. In trying to correct for this problem I have PEC trained the controller which helped a little. Another thing that I found which had a great affect on how well the scope tracked was the balance on the RA axis. 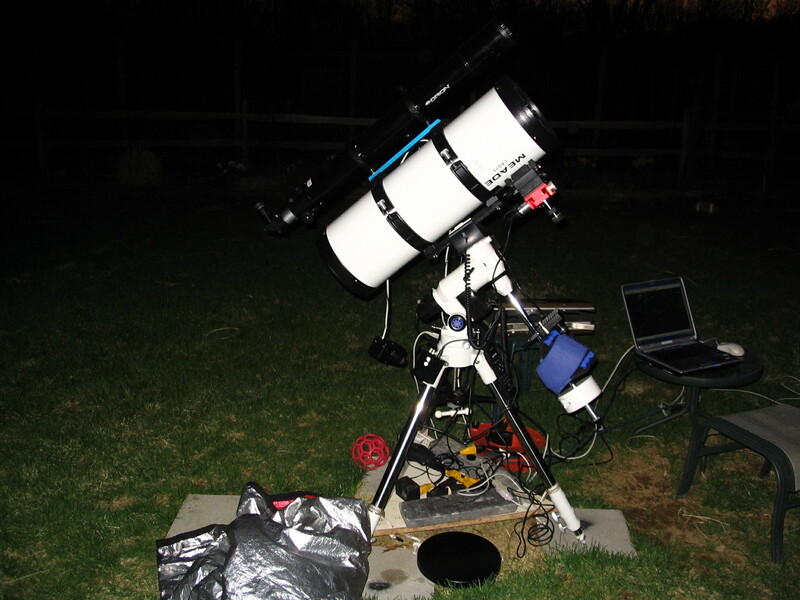 When setting up for imaging I shift the weights so that the scope weight is slightly biased to the east. This helps keep the load on one side of the RA worm gear since it always turns to the west. Using this balancing act, on a good night, I may even be able to run some 30 second exposures. Unfortunately for many DSO's 30 second exposures just don't cut it. To get enough photons into the camera to pick up the fine detail for some targets 2 or 3 minute exposures sometimes even longer are need. The only way this is possible is by using a guide scope, camera and software that will keep the setup locked on a target allowing for such long exposures. I have finally chosen to go that route and purchased a used 80mm f11 guide scope made by Orion. At this time I have not yet had the opportunity to try it out. My plan is to use the Philips SP900Nc web cam as the guide camera and guiding with PHD created by Stark Labs. 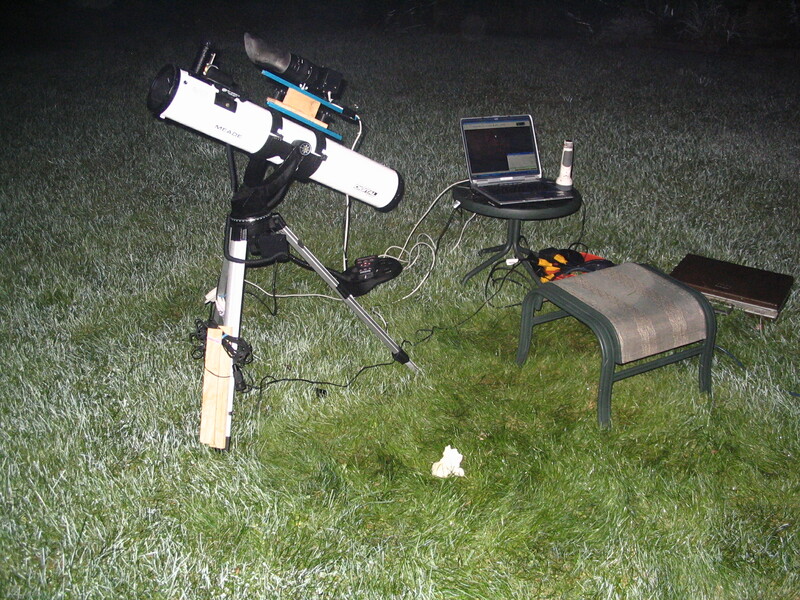 I'll use the Meade DSI for imaging, as I have been, on the SN8. My hopes are that I can get at least two minutes exposure time if not better. While waiting to try out my guide setup, we had a beautiful day and there were some interesting sun spots available for imaging so I put my DS114 on my LXD75 mount and took a few pictures. To mount the DS114 on the LXD75 I made a dovetail bar out of oak to match the profile of the dovetail on my SN8, I picked up a set of tube rings from ORION and screwed them to the dovetail plate. The setup works like a dream. Finally got my guiding set up and started playing with it. As I mentioned above I'm using a Orion 80MM f11 refractor as the guide scope and the Phillips SPC900NC SC1 as the camera. The guiding software is PHD by Stark-Labs. I had to make my own mounting for the Orion scope using a T-Slot rail (Light blue on top of the SN8) which is screwed into the Meade scope rings. Using two Stainless steel carriage bots If fastened the rings for the Orion scope to the rail. So far it's holding up. Nice and solid. Because of the extra weight of the 80mm, I needed to add some counter weight. Here I'm using some 5Lb ankle weights temporarily. Now to get the guiding set up and working correctly.